ST. GEORGE – A new student housing project on Tabernacle Street was approved by the City Council Thursday. The council also approved a general plan amendment for it’s southern end, moving along a proposed 3,350-acre, multiyear project. A proposed student housing development is slated to take over roughly two-thirds of the block on Tabernacle Street between 600 East and University Avenue (also known as 700 East). The project is composed of two large complexes – one standing at five stories and the other at four stories – and is planned to contain 113 units that will house over 400 students who will be attending nearby Dixie State University. 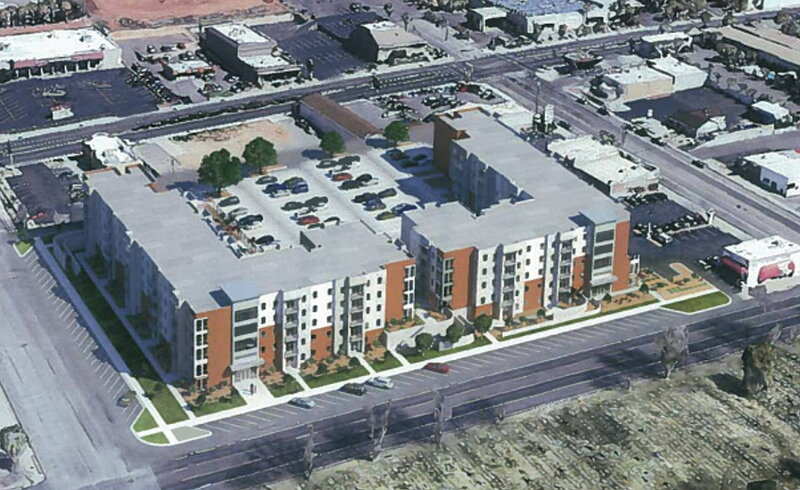 The project, called “605 Place” for the time being, will cover an area currently occupied by the Sunburst Shopping Center, a handful of smaller buildings formerly used by Dixie State and some homes. With the exception of Cameo Florist, which sits on the corner of Tabernacle Street and University Avenue (700 East), the remaining area will be demolished. Businesses along the St. George Boulevard side of the block are not a part of the new development. While the City Council was generally in favor of the project, there were concerns there is not enough area designated for parking. “I’m a little concerned we’re going to create a parking nightmare if we’re not careful,” Councilman Jimmie Hughes said. Due to the nature of the project, general parking space requirements held by the city are reduced. However, city code requires that student housing developments limit renters with vehicles to 75 percent. The remainder will need to go without. If this requirement isn’t enforced, the student housing complex will have to reduce the number of beds available, City Manager Gary Esplin said. Matt Hansen, a representative of Peg Development, which oversees the 605 Place project, put forth the possibility the vacant lot sitting between Taco Bell and The Chalet Motel, in the process of being sold to Peg Development by Dixie State University, may provide the extra parking space the city is asking for. Councilman Joe Bowcutt said he didn’t want to see a parking lot on St. George Boulevard, and Hansen said he agreed. 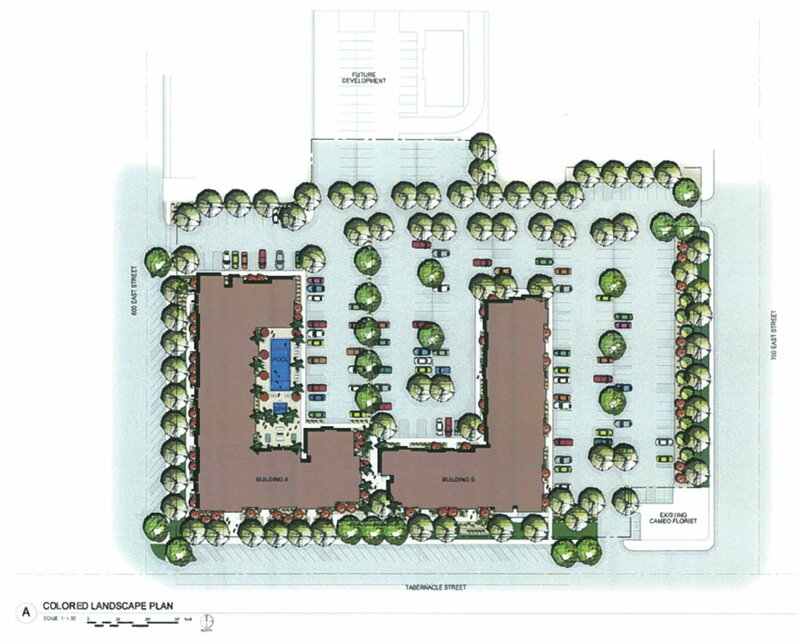 While a section of the lot would be devoted to parking, the front would be used for a small commercial development, such as a restaurant pad or office space, Hansen said. Council members liked the idea and subsequently approved an ordinance change allowing the project to move forward. The new student housing project is the third to appear within the last two years. In order to accommodate growing student housing needs, Dixie State University built the Campus View Suites that opened last fall. A second housing project located at 850 E. Tabernacle St., the 256-room The Vintage at Tabernacle, is well underway in construction and slated to be completed sometime in August. Dixie State welcomed its largest freshman class to date in fall 2016 with 2,300 registered newcomers for the fall semester. The University anticipates attendance in fall 2017 may rise by an additional 500-800 students, Mayor Jon Pike said. 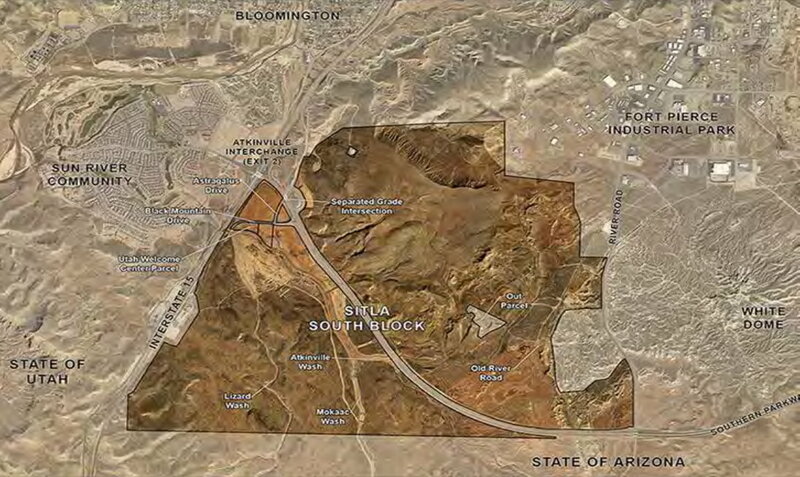 The City Council also approved a general plan amendment for the city’s “south block,” which covers the area extending from the Fort Pierce Industrial Park to the north to the Utah-Arizona border to the south, and from Interstate 15 on the west to the Fort Pierce Industrial Park area on the east. The area covers approximately 3,350 acres. The general plan amendment makes way for a reworking of the current plan so a new development plan can move forward. Called Desert Color, it is no “overnight project,” Hughes said. Plans to develop the city’s south block have been in the works for years. The proposed plan itself could take decades to roll out as it is built here and there. Plans for the massive project include a central commercial town center, mixed-used commercial centers, resort commercial and residential neighborhood developments. It is anticipated to feature over 10,000 residential dwelling units and support over 30,000 full- and part-time residents. However, Baca raised the question of where the water for the development would come from. It is a question he has asked on a regular basis, he said. A waterline into the project area connecting to a line out of the nearby SunRiver St. George development has already been built, Esplin said, and the Washington County Water Conservancy District is already looking at constructing a pipeline between the south block and the Sand Hollow Reservoir. Developers are looking at ways to best use irrigation, reuse and city culinary water, Esplin said. As well, the new project features a lower population density than the one it replaces. They spend all this money to lure in the students, but then refuse to hire full time professors and pay the part time adjuncts almost nothing per class. Probably true. Why spend the money to hire teachers when you can spend that same cash on the athletics budget? Who needs all that fancy book learnin’ anywho? In all likelihood there won’t be any rocket scientists or neurosurgeons coming out of dixie state, so might as well just focus on athletics? Last I heard it was just kind of a factory for producing fresh new CNA’s and medical assistants. How they got university status I have no idea. Too funny really. I submit that a) parking is NOT an issue in DSU administrative minds, b) adjuncts are necessary in order to fulfill the desire to have a human performance/health and well being building. Ask this question, when was the last salary increase given to the adjunct faculty?